How to make a trending veil using own hands, And a bit of magic. It was the very first edition of Trend Report that covered such a hot piece of the season as veil back in late February. You can have a recap of that story right HERE. Veil is back in many different forms, styles and even colors. One of those popular styles is veil attached to a hairband. Today we are going to look at how to create such a veil using own forces. So lets go step by step and find out how to upgrade your seasonal looks with a mysterious, alluring and trendy accessory. 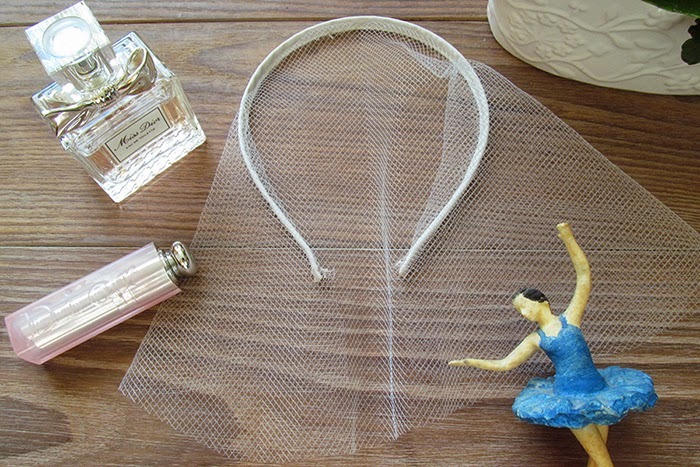 A piece of veil (net, lace, etc. ), ideally big enough to be cut according to your length preference. 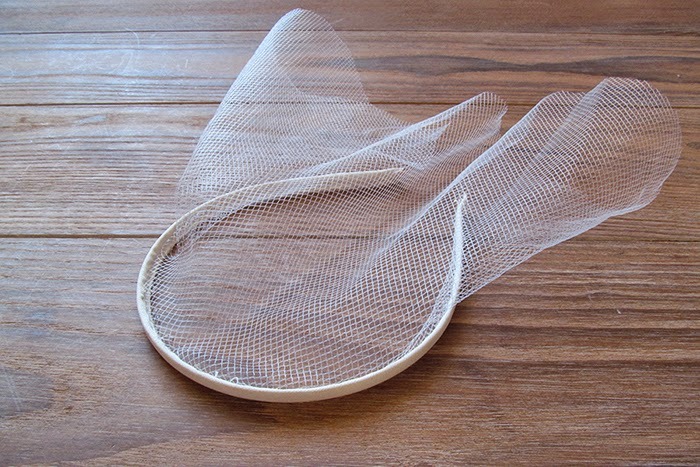 I took quite a big piece of a small net veil a la bridal one. The color of the fabric is up to you - usually it's black, but can also be white or colorful. Hairband - metallic, plastic or already covered with a piece of fabric. The one that already has a piece of fabric around will simply save you a good portion of time. 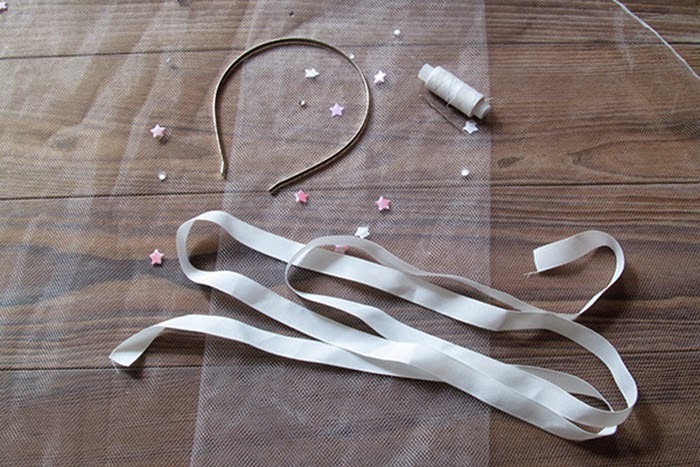 In case you choose a metallic or plastic hairband, you will need a piece of ribbon or fabric using which you are going to cover the band. The texture is up to you, though I wouldn't recommend using something like silk, so give preference to a less sliding fabrics. In terms of color, ideally it should match the color of the veil, but, again, it's your piece of art, so you can use all your creativity and imagination. Finally, we will need a needle and threads. Again threads should match the color of your veil and hairband combination. In my case everything is pure white. In case you are going to cover the hairband on your own (if it's already covered, just skip this step). Width of the ribbon or a piece of fabric should perfectly match your hairband. Make sure straightaway it's not too narrow, if it turns to be wider when covering the band, it can be fixed by cutting the excess piece. So at this stage you simply sew the two sides of a fabric together and then put the hairband inside. 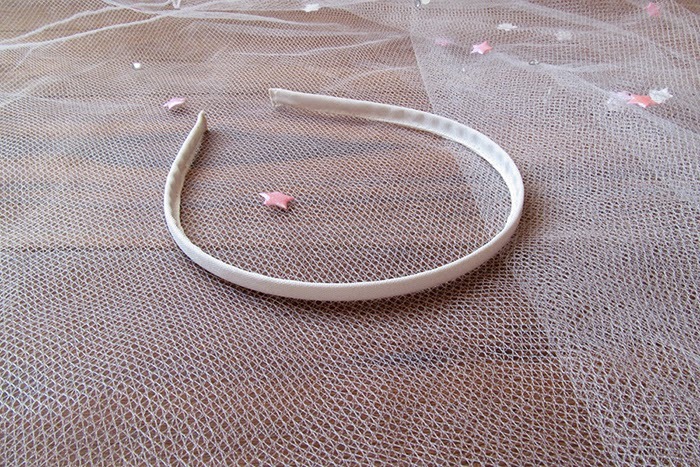 At this step you sew the veil to the hairband. Sew it on the inside of the band, therefore, threads are not visually seen afterwards. Try the veil on prior sewing it on and figure out how to make folds, it shouldn't be too big, so when sewn on the veil lies properly over your face. My veil was way too big, so I did cut it in half. Still the half had an extra length that allowed me to cut it, i.e. make several changes, when it was finally sew to the hairband. The final step is about making last changes to your veiled hairband. This may involve cutting the veil a bit shorter, so it ends at your nose line or eyes line. You can also leave it long enough to cover all your face. Your veiled hairband is a reflection of your preferences and style. So use all your imagination and creativity. If you want, you can also sew on or glue on some details, like flowers, stars, hearts and so on. To finish off today's DIY story I feel like showing the result of my veiled hairband in action. If you were wondering whether a white veil is a good idea, here's an answer. A very Summer-y option, don't you think? And when combined with an equally interesting yet charming piece, in my case it's a Cotton Candy dress by designer Katerina Zhigulich, it doesn't leave you slightest hint of a bridal veil. On the contrary, a high class fashionable piece.